Malaysia | Say NO to Human Trafficking! February 20, 2018 – In its January meeting, the Conference of Religious Major Superiors (CRMS) Malaysia-Singapore-Brunei formalised the inauguration of Arise, the CRMS desk for dissemination of information and coordination of anti-human trafficking initiatives between Institutes of Consecrated Life and their ministries across the three countries. The idea for Arise had been conceived at the Southeast Asia Major Superiors Congress in Pattaya in December 2016, and discussed in CRMS meetings in 2017. In November, several religious and lay collaborators met in Kuala Lumpur to plan how Arise could work. One immediate outcome was the participation of three lay representatives at the Talitha Kum Asia meeting later that month. The Arise desk will work in close partnership with the Global Shepherd network, and has joined the Talitha Kum network. It will also collaborate with local Church leadership and NGOs. The CRMS has mandated Arise to organise an annual programme of awareness and engagement with the local Church and wider community, sponsored by CRMS, to commence in late 2018. We continue to pray, as Pope Francis recently asked, “that the Lord may convert the hearts of traffickers … and give those who are caught in this shameful scourge the realistic hope of regaining their freedom”. February 8, 2018 – On the Feast of St Josephine Bakhita, designated by Pope Francis as a day of prayer, reflection and action to end human trafficking, we join the Holy Father in praying that “that the Lord may convert the hearts of traffickers … and give those who are caught in this shameful scourge the realistic hope of regaining their freedom”. Yesterday, during his general audience, Pope Francis appealed for concerted action against human trafficking by civil society and institutions. We take this opportunity to share that the Trees of Hope campaign resulted in a mini-forest of almost 60 trees. The campaign was launched on July 30, 2017, during the ceremony for the signing of a joint declaration by faith leaders in Malaysia, organised by the Catholic Archdiocese of Kuala Lumpur in collaboration with the CRMS. 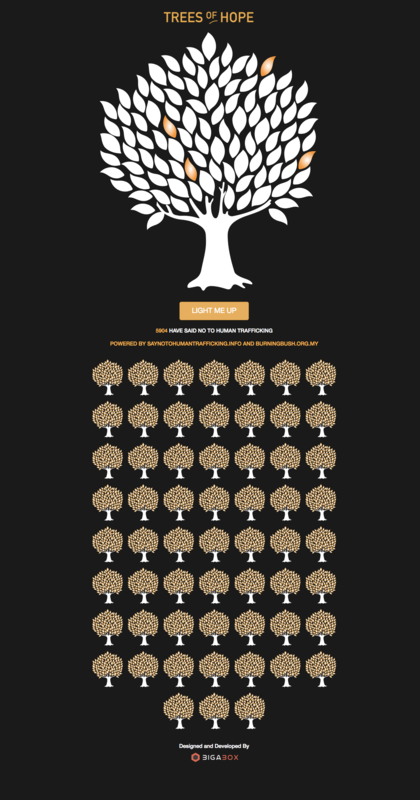 The faith leaders were the first to light the virtual Trees of Hope and by the end of the campaign, 5,904 people had lit a leaf, taking a first concrete action against human trafficking. Inspired by our confessions of faith, we, the undersigned, stand together today in solidarity with the millions of people who have been trafficked and enslaved. In our religions, every girl, boy, woman and man is a free person, and all exist for the good of all in equality and fraternity. That people are trafficked and exploited physically, economically, sexually and psychologically for the profit, benefit and pleasure of others goes against the fundamental conviction that all people are equal and have the same freedom and dignity. Human trafficking is a crime against humanity. It is a scourge that must be eradicated. Thus, we pledge today to do everything in our power, within our faith communities and beyond, to fight against human trafficking and to work for the freedom of those who have been trafficked and enslaved, that their dignity may be restored and that they may once again have reason to hope. December 12, 2016 – Catholic religious from six countries in Southeast Asia have made a joint declaration against human trafficking. This commitment was made as the 72 delegates from Indonesia, Malaysia, Myanmar, Philippines, Singapore and Thailand concluded a meeting on “Integrity of the Human Person vis-à-vis Human Trafficking” held in Pattaya, Thailand from November 5 to 9. They pledged to motivate and inspire their communities to fight for the freedom of all those who are trafficked and enslaved; to work with civil authorities, international and local NGOs, other faith communities and other people of good will to eradicate human trafficking; and to do all in their power to ensure that the dignity of victims of trafficking is restored, and to give them reason to hope. 26 July 2016 – Malaysian authorities need to prosecute more human trafficking cases if they are serious about tackling the problem, NGO leaders said Tuesday as a U.S. ambassador at-large who specializes on the issue was visiting the country. Representatives of several local NGOs voiced such concerns during a Monday night meeting in Kuala Lumpur with Susan Coppedge, the U.S. State Department’s envoy for the monitoring and combating of human trafficking, according to one of them. They also told Coppedge about their frustration over a lack of official follow-up after last year’s discovery of scores of graves in the jungles of northern Perlis state that held the remains of smuggled people. “We feel that we can have all the laws on trafficking that we want in Malaysia, but if there is not enough implementation on the ground, nothing is going to work,” Sumitha Shaanthinni Kishna, coordinator of the Migration Working Group, one of the NGOs, told BenarNews. On 30 June 2016, the US State Department released its 2016 Trafficking in Persons (TIP) Report. The ranking of both Malaysia and Singapore are unchanged. Malaysia remains in the Tier 2 Watch List and Singapore in Tier 2. On 21 November 2015, Asean leaders signed the Asean Convention Against Trafficking in Persons, Especially Women and Children (ACTIP). This document establishes a clear and precise legal framework for the Asean region to address the complex issue of trafficking in persons. PROMOTE cooperation among the relevant parties. August 6, 2015 – As part of the international Year of Consecrated Life, the Catholic Religious in Malaysia, Singapore and Brunei have ramped up their collaborative efforts to fight human trafficking. With the assistance of a collaborator, they created this website to spread the word about human trafficking and to make the materials they have developed available to a wider audience. The website, http://saynotohumantrafficking.info, went live on July 30, UN World Day Against Trafficking in Persons. The Religious priests, sisters and brothers also moved from raising awareness to urging action by committing to urge Catholics in their ministries to pray a Rosary Against Human Trafficking. The special rosary prayers are based on the Sorrowful Mysteries of Christ, and can be downloaded here.